Along the stretches of I-80 west, Dan Chase watches the Nevada landscapes drift in and out, stitching together a panorama of a fading summer. It’s late August. Salt flats gleam chalk white, shadows on mountain faces deepen, passing cars stuffed with laundry return students back to college. This delivery for Dan is a long haul––2,374 miles to be exact––from Grand Rapids, Michigan to Navarro, California. 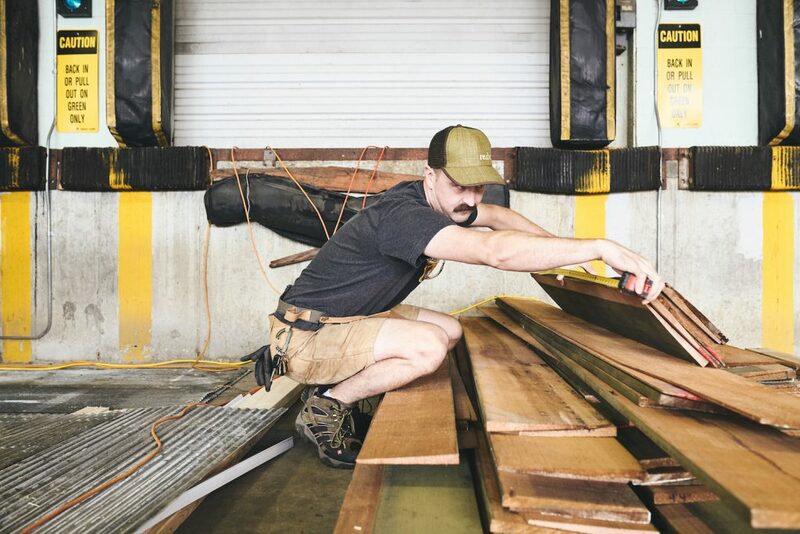 As a sought-after custom-furniture maker, delivering furniture pieces and installations across the country is nothing new for Dan, but, what is new is the cargo he tows: a 16ft off-the-grid trailer, designed and hand-built for Merrell. It’s the maiden voyage for this trailer, bound for the Outpost outdoor trade show and retreat in Navarro. It’s 36 hours into the journey. 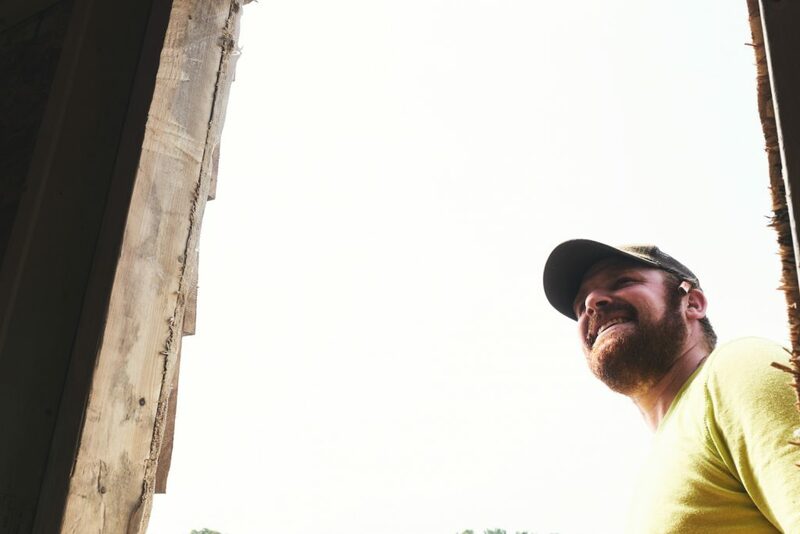 A journey, that for Dan, began 10 years ago in the town of Muncie, Indiana. At Muncie, Dan was earning a Master’s degree in Architecture at Ball St. University. 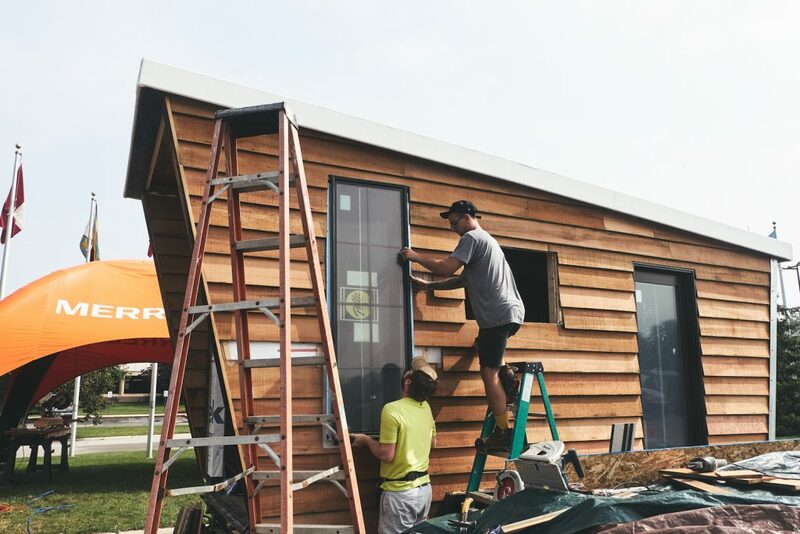 The son of two progressive and broad-minded parents, Dan was drawn to the practices of sustainable design and alternative building methods. As with any college student, his desire to learn was also met with the necessary desire to make money. So, through local connections and an odd string of occurrences, he and a friend contracted jobs demolishing and salvaging homes, casualties of blight. 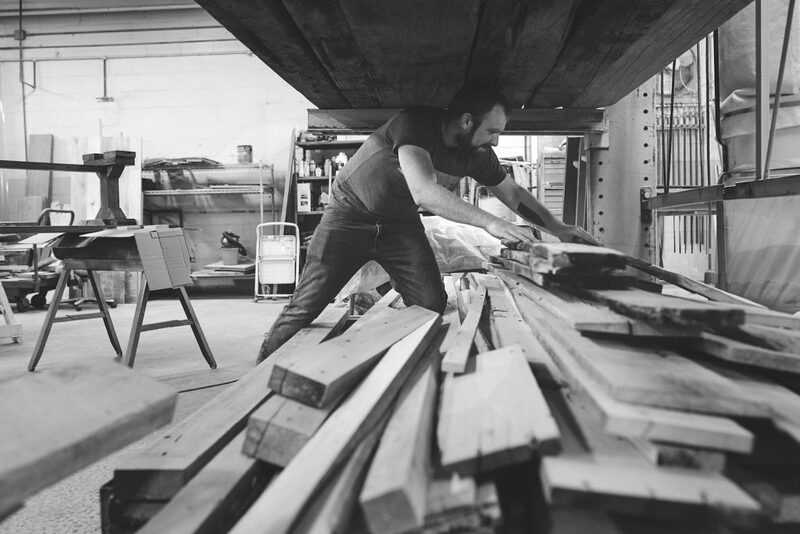 It was this introduction to deconstructing homes––not constructing––where Chase discovered his passion for reclaimed building materials, particularly wood. 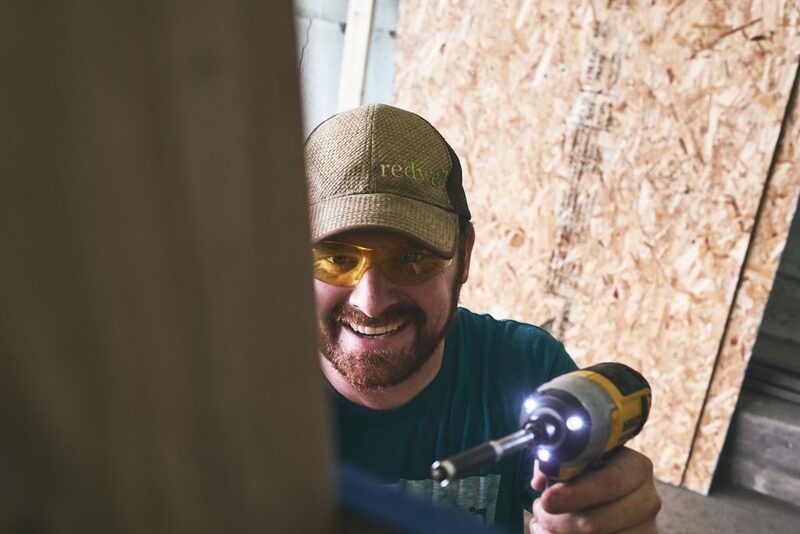 “I started tinkering with new uses for the wood I harvested, and this became my thesis: creating sustainable modular housing with repurposed lumber,” says Chase, soft-spoken. 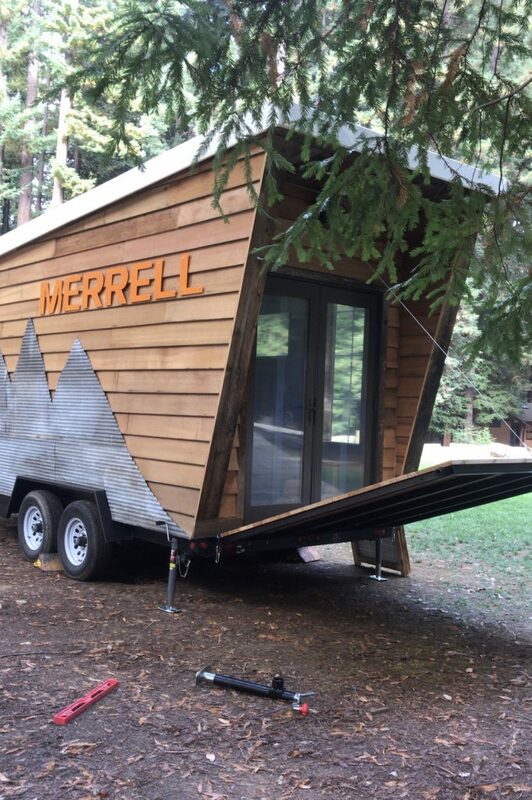 For Chase and the re.dwell crew, design and fabrication of the Merrell trailer was an uncharted challenge. 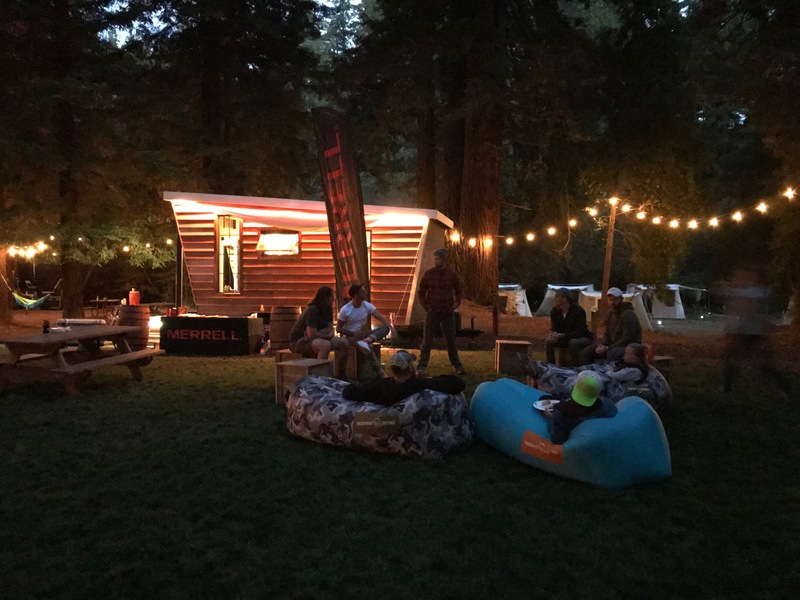 The design of a mobile activation space that needed to be transported thousands of miles throughout the year required not only expert structural engineering, but also understanding of what materials could withstand the forces of nature, not to mention interstates. Old-growth wood makes great armor. 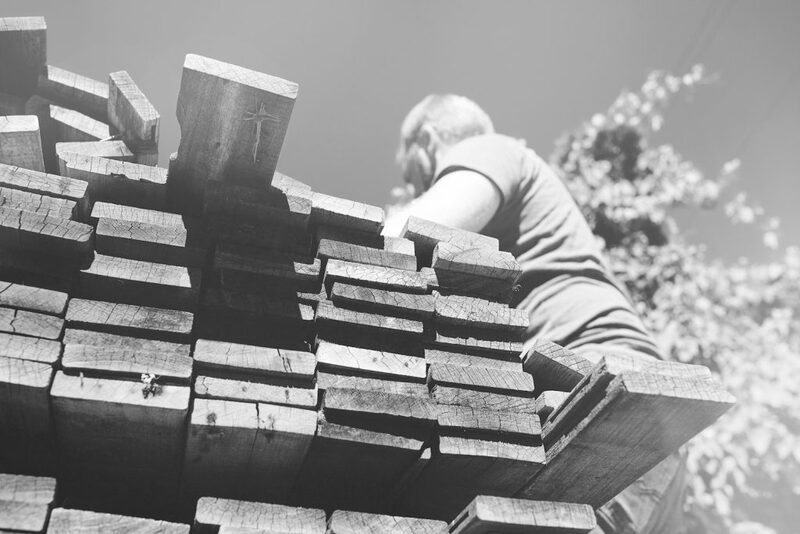 The characteristics of old-growth wood are vastly different than modern woods, the lumber you buy at a home improvement store. The wood grew slower, making the rings more compact, the wood stronger. 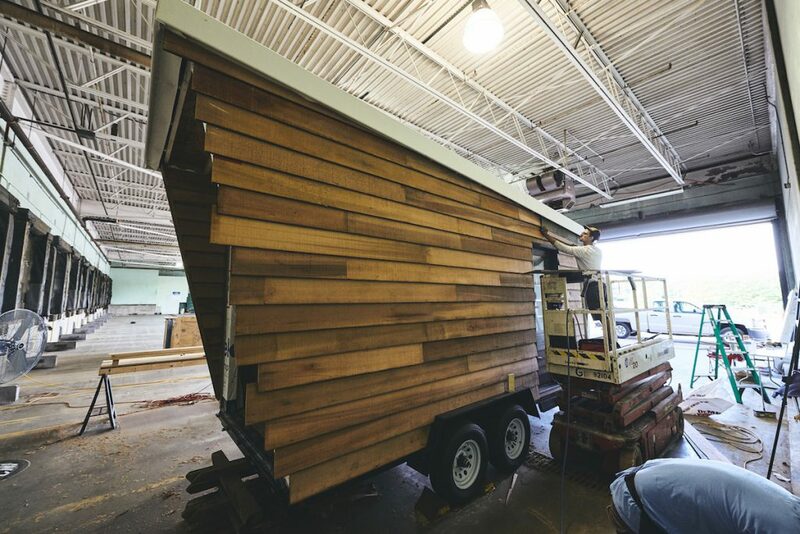 Most of the wood selected for use on the trailer was old-growth wood, personally harvested from demolish job sites by Dan. 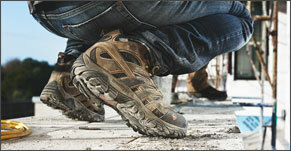 Also important to both Dan and Merrell was that energy used by the trailer be self-sufficient. 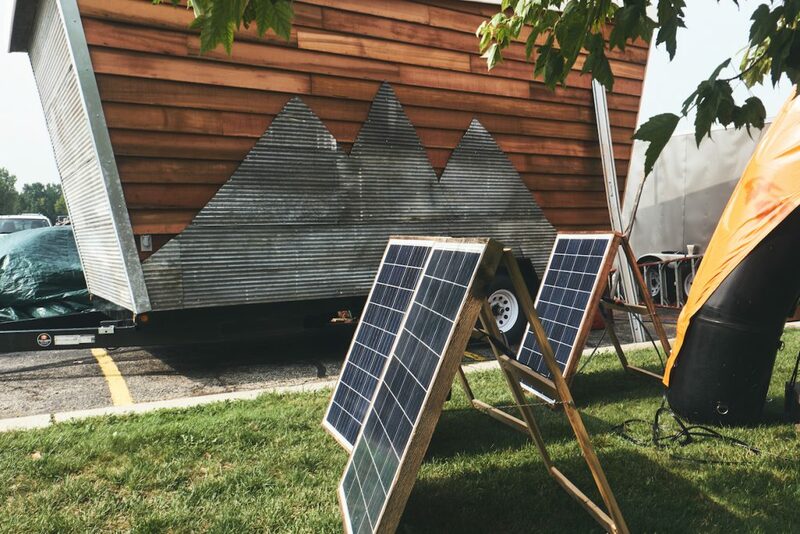 Chase ingenuously engineered a portable solar panel system, more than capable of supplying enough power to the trailer. 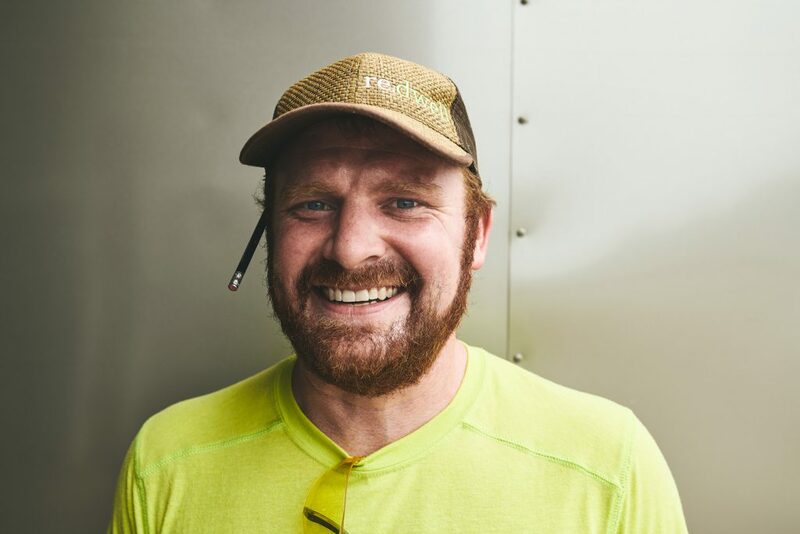 Always resourceful, Dan and his crew also used the trailer’s solar technology during construction to power tools. Constantly aware of any opportunity to reuse or conserve, he grabs it. Not just in his projects, but in every aspect of life. 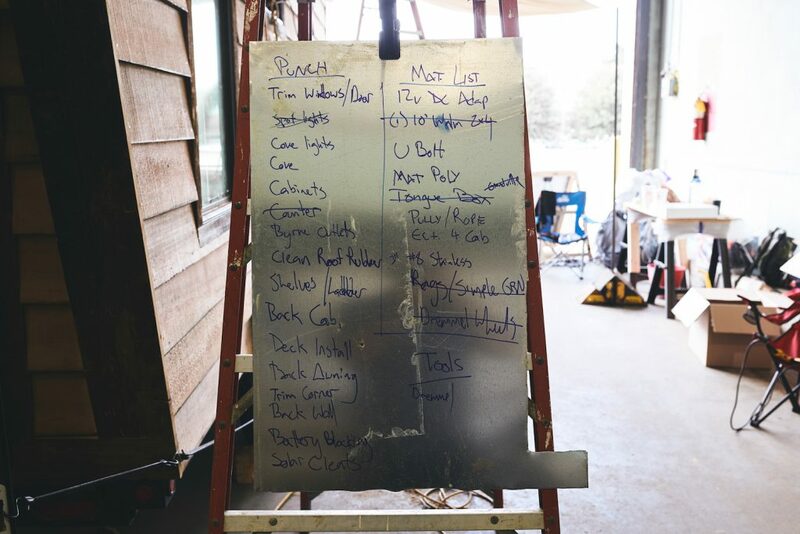 Every scrap of waste on his projects find a new life or are responsibly recycled. 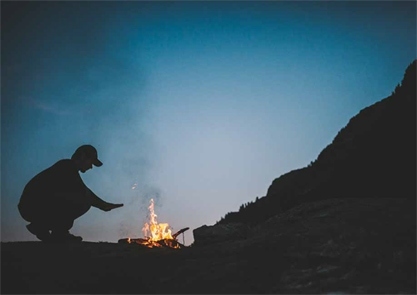 Asked why he believes so strongly in sustainability––protecting the nature––his answer is a brief: “Common sense.” Dan is as efficient with his words as he is with his materials. 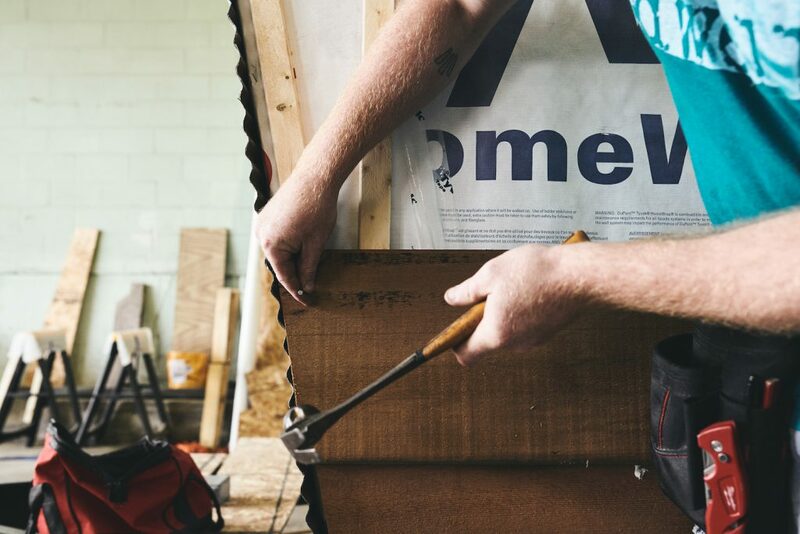 As construction unfolds, the rhythm of the re.dwell team is focused and synced––there’s a tight deadline to meet. However, it’s never lost on these guys that what they do is fun. Dan’s creative vision begins to take hold and the trapezoid silhouette of the structure appears. 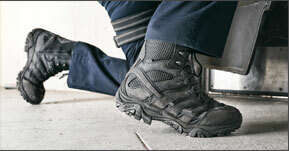 The shape is dynamic, unexpected––his architectural background released. 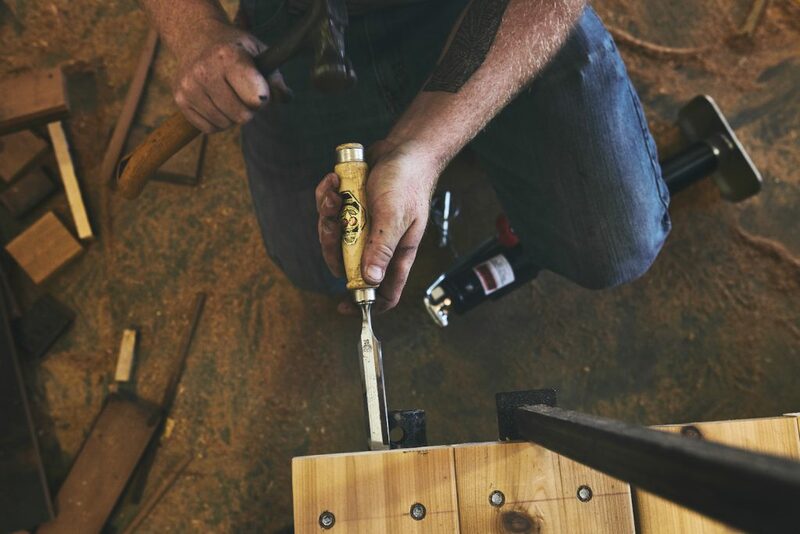 Dan and his team have exceptional carpentry skills, perfected from hundreds of furniture projects, yet, strokes of imperfection give the structure character. What strikes you most watching construction is the harmonic beauty of the mixed woods being used (or reused). For in each board and plank lies history from another life––another era: Redwood boards salvaged from turkey hatchery in Zeeland, Michigan; clear cedar siding from a northern Michigan cottage; sheet metal rescued from a demolished barn; Ipe flooring from a suburban medical center; curly maple from a factory in Bay City, Michigan. 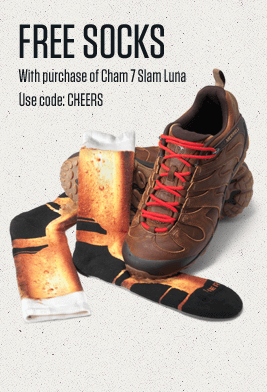 “You can’t find this stuff anywhere,” Dan says, beaming. This is a guy that loves wood. Shepherds it for time. Construction nears completion. The awning unfurls in the breeze, the retractable deck tested. The interior cabin comes alive; display shelves are hung, brand elements applied. 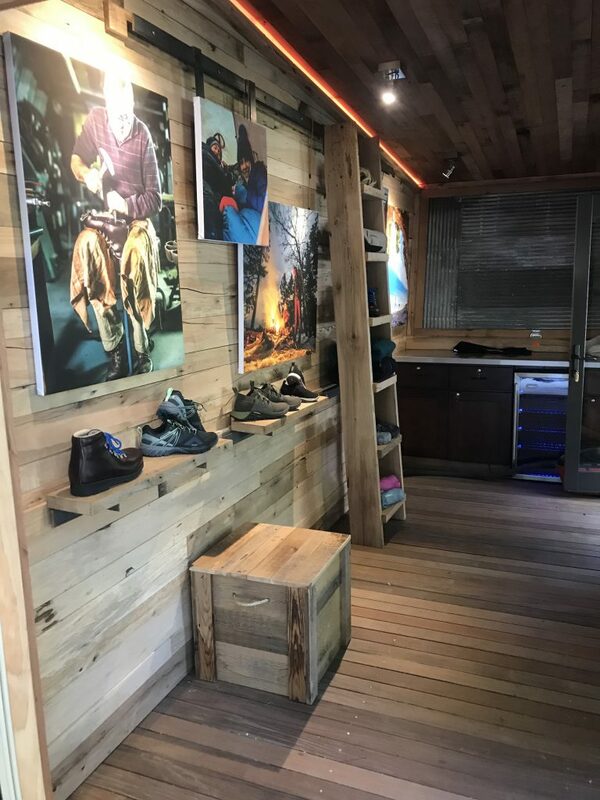 For the Merrell team, it’s a first chance to see what is more than a custom-trailer, but what will be the opportunity to bring people and the outdoors together, coast to coast. 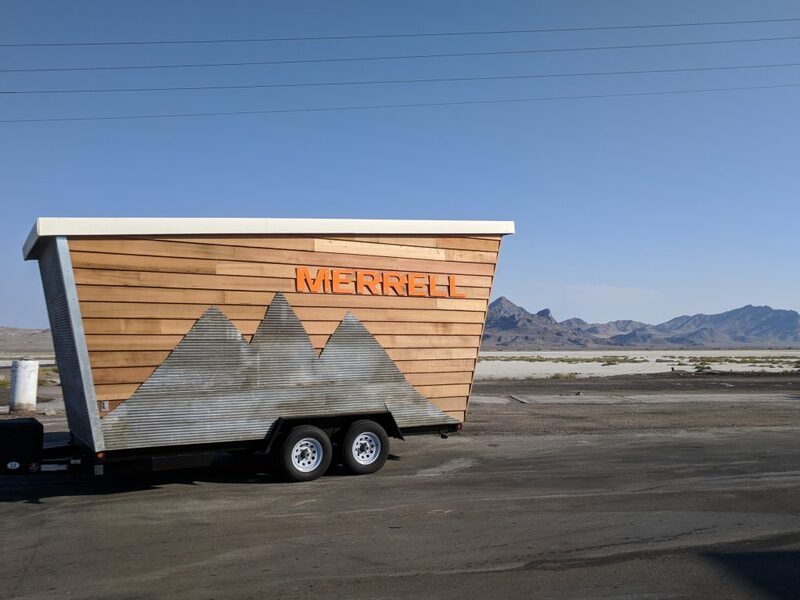 The journey across eight states complete, Dan and the Merrell trailer arrive at Outpost. 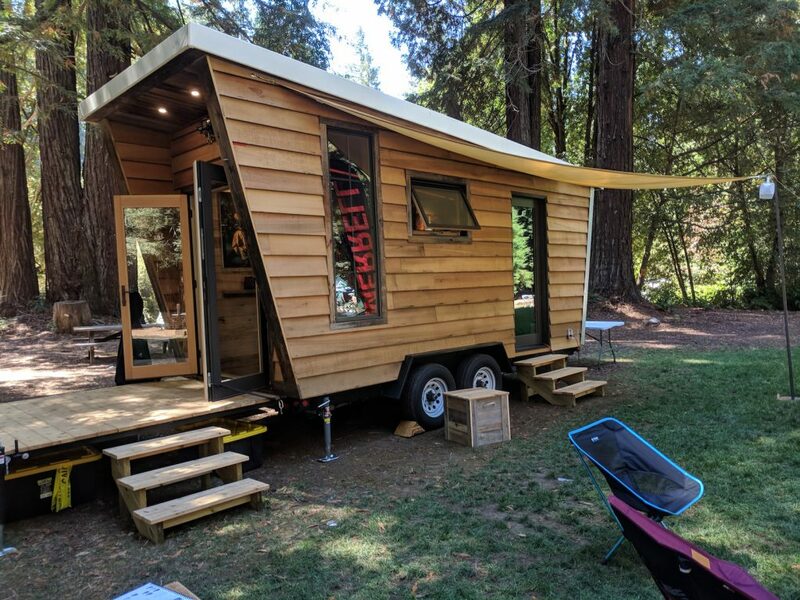 Nested amongst the mammoth California redwoods, the trailer in some ways has returned home. Redwood, salvaged from a shuttered turkey farm in West Michigan, had come full-circle, back to its origins. A coincidence? Perhaps. Maybe something more. Attendees at Outpost marvel at the trailer, they marvel at Dan’s creativity. 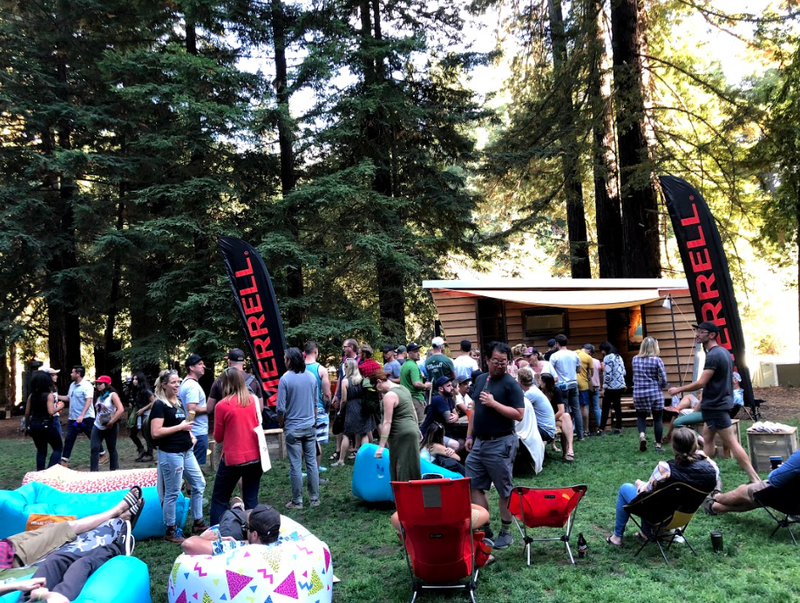 For the team of Merrell and re.dwell, this collaborative concept of great people coming together in the great outdoors is now in plain sight. 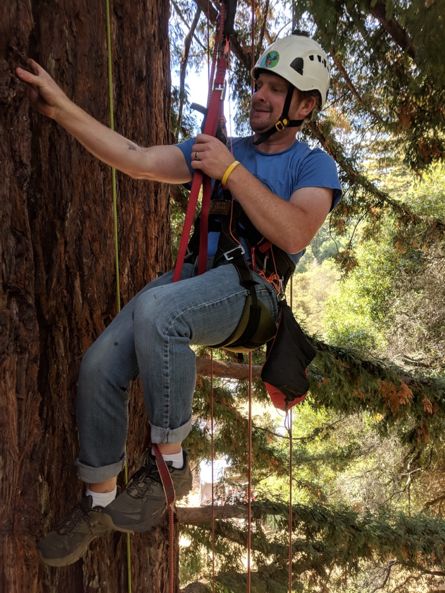 A few days at Outpost to relax from the cross-country drive, Chase is offered the chance of lifetime to climb the giant Redwoods. Like arms reaching out, the redwood branches greet him, the warm sun filtering through the needles. Sap flows; roots meet. The lines between nature and humanity fade, the grand design of nature blows in the wind. For Dan, holding it all close.